Relax and pamper your body and mind in our BALTIC SPA. The natural living space of the Baltic Sea has been recreated in loving detail on 1.300 sq m. Whether the impression of walking on a jetty or sitting between rocks, of listening to the waves of the ocean while looking at the Kuehlung – our extensive beauty and wellness program will overwhelm you in this unique setting. 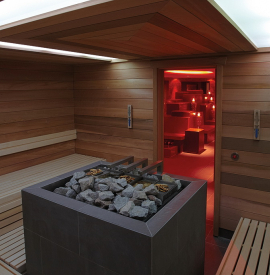 Look forward to the sauna landscapes with multi-sensory showers and ice fountain, hydro therapy, hot stone massage and the cozy comforting warmth of the light tepidarium or the heated loungers. In the Private SPA of approx. 70 sq m you can enjoy precious togetherness in a couple's bathtub, on the couple's heated loungers or with a shared foot bath. The beauty ritual Rasul will not only make your skin extra smooth, but will stimulate your senses for new experiences together before relishing in a couple's massage. Dive into this oasis of peace in the Upstalsboom Hotelresidenz & SPA Kuehlungsborn and turn the time of a wellness and beauty treatment into the best one of your day! In order to guarantee desired dates for beauty and wellness treatments, please make an appointment before arrival and contact us on +49 (0)38293-4299-800 or fill out our application form.